Elijah has never been a very good sleeper. 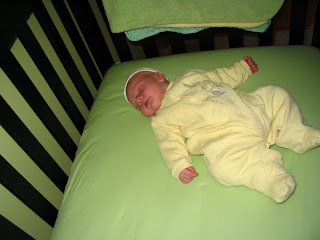 I should take that back, because at one point, Elijah was actually an excellent sleeper. Between two and four months, Elijah slept eight to ten hours straight - every night. We thought we were extra special, that because we had been through so much at his birth, God gave us a good sleeper. But, Elijah was still on Phenobarbital at the time and was probably groggy. Not to mention, he had a massive injury to his head at birth. That'd make anyone tired. Needless to say, his sleep habits have changed many times over these past eighteen months. 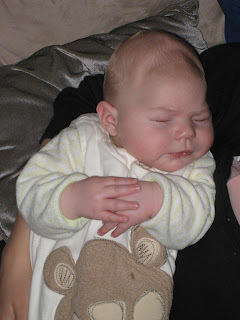 When we got to bring Elijah home from the hospital, he was still extremely sleepy. We actually had to wake him up to feed him – something I never thought I'd be doing in my pre-parenthood days. (Don't they say: Never wake a sleeping baby!?) Eventually we stopped setting the alarm clock to wake him – he became quite capable of waking us up on his own. Then came the aforementioned glorious two months when Elijah slept through the night – and he has only done it a handful of times since! I can't seem to figure the little guy out and I guess that's probably just part of the parenting ritual. You think you've gotten things figured out, when Wham!, everything changes again. The only time Elijah has been a really good sleeper is when we were doing HBOT. So, perhaps next month he'll be sleeping like, um, a baby. 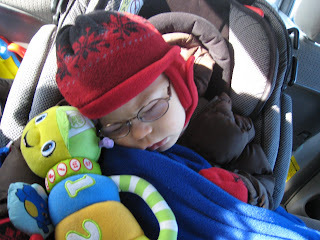 On the rare instances Elijah has fallen asleep in the car, I take a picture. Perhaps someday the boy will sleep through the night. Perhaps someday he will take naps without a fight. Perhaps someday he will curl up on the floor (and without any assistance from me) go to sleep. Someday. In the meantime, how can you resist this little sleeping face? If I've learned anything since becoming a mom, you just never know what is going to happen next. Perhaps ten hours of uninterrupted sleep? Hey a gal can dream, can’t she? We appreciate you sharing your story from a mom's perspective. Becoming first-time parents certainly is a wonderful blessing and yet a challenging experience, too. My husband and I have both worked with our daughter to help her learn and develop, but we've been very blessed to qualify for local community assistance, which has kept our costs down. Our thoughts and prayers are with you as a mom, as well as your husband, son and extended family. God teaches us a lot through family, which is such a blessing. Hi. Elijah looks extra yummy sleeping! It's weird, Max was on phenylbarb, too, for the first six months of his life. And it did not make him groggy. During the daytime when he was a wee infant, he'd maybe take 20 or 40 minute naps, it was a really hard time, especially considering all that we'd gone through. 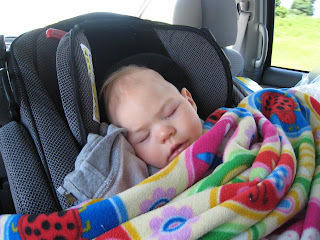 And, like Elijah, for the longest time he wouldn't sleep in the car. Now he does, on occasion. Now our big problem is that both kids are sleeping in our bed. We have to deal with this, but we keep putting it off! Ellen- I think that you are reaffirming my thought that the sleep process when it comes to kids isn't easy. Sometimes I will spend 30 minutes getting Elijah to sleep to only have him sleep 30 minutes! Like Max, Elijah has never been a good napper. And, don't kick yourself for the kids sleeping in bed. Elijah ends up in our bed in the middle of the night too. You're not alone! I guess for us, my hubby and I both kind of enjoy having him with us and all snuggling together. I read a book called Sleepless in America by Mary Sheedy Kurcinka which really helped me understand how our bodies work when it comes to sleep. I'm no closer to getting Eli to sleep through the night, however. ;) For us, I think it's a healing thing. We almost lost him and we don't mind having him close at night. And I know that's a feeling you can relate to. Elijah’s Fundraiser was a HUGE Success! Elijah’s Fundraiser is this Sunday!